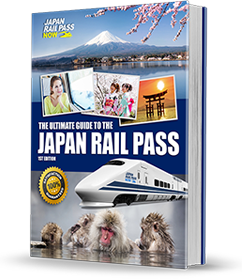 Springtime in Japan is a high-volume tourist season as people from all over the world travel to the country to view the blossoming of the sakura. 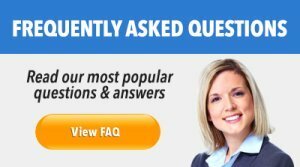 Every year, various places around the country are filled with crowds for a few weeks in April and May, as this seasonal event reaches its peak. Matsumae Park – With many thousands of sakura trees growing around Matsumae Castle, the Matsumae Park becomes a sight to behold once the cherry trees bloom in spring. Goryokaku Fort – A Western-style fortress built during the Edo Period, the Goryokaku Fort occupies a large area that is home to many hundreds of cherry trees. 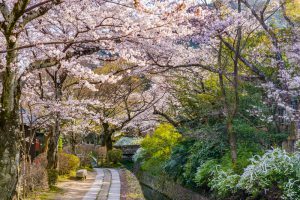 Tsutsujigaoka Park – Centrally located in the city of Sendai, Tsutsujigaoka Park is home to a number of sakura tree varieties, including the weeping forms and Somei Yoshino. 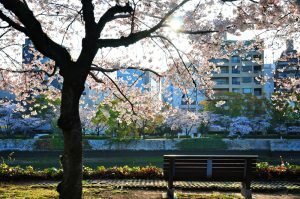 Mikamine Park – With several hundred cherry trees, Mikamine Park is a large, spacious public park that is a popular hangout and venue for hanami parties. Matsumoto Castle – Located in the city of Matsumoto in Nagano Prefecture, the Matsumoto Castle grounds contain approximately 300 thriving sakura trees that look magical once the spring season kicks in. 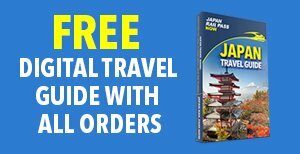 Takato Castle Ruins – Found in Ina City in Nagano Prefecture, the Takato Castle Ruins area has a garden that grows an array of cherry tree varieties, making it a highly recommended cherry blossom spot not only in the region but in the entire country. Ueno Park – A very popular spot for cherry blossom viewing, Ueno Park is located in Tokyo and gets extremely crowded during the peak dates of the sakura blossoming. 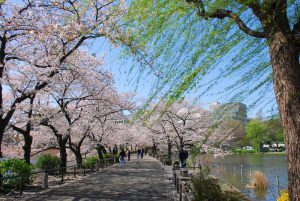 Yoyogi Park – Ideal for picnics with family and friends, the vast area of Yoyogi Park is home to more than 600 cherry trees. Shinjuku Gyoen – With over a thousand cherry trees of different varieties, Shinjuku Gyoen is a large park that offers fantastic cherry blossom viewing opportunities. 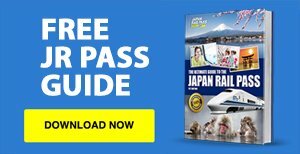 Day Trip: Kawaguchiko – You can make your way to Kawaguchiko from Tokyo to catch a sight of the Cherry Blossoms on the Northern and eastern shores of Lake Kawaguchiko. 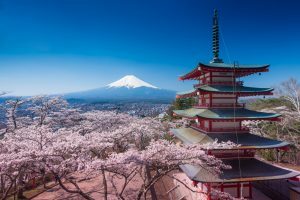 Mitsuike Koen – Declared as one of the top 100 cherry blossom spots in Japan, Mitsuike Park consists of three ponds that are surrounded by more than a thousand sakura trees. Sankeien Garden – A Japanese landscape garden that features a pond at the centre, numerous historical structures, and plenty of cherry trees, the Sankeien Garden is a famous hanami spot in Yokohama. 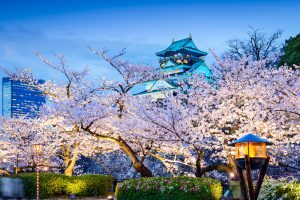 Osaka Castle – The Osaka Castle grounds contain more than 4,000 cherry trees that look magnificent when in full bloom. 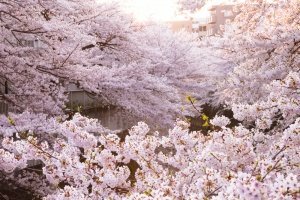 Kema Sakuranomiya Park – Located along the Okawa River, the Kema Sakuranomiya Park provides a long line of gorgeous sakura trees in full bloom in spring. Philosopher’s Path – About two kilometres long, the Philosopher’s Path is a good spot to enjoy a stroll under the canopy of cherry trees in peak blossom. 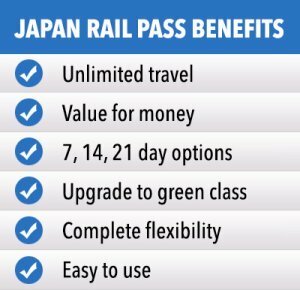 Arashiyama – Situated in the western outskirts of Kyoto, Arashiyama features plenty of sakura trees at the foot of its mountain ranges, close to the Togetsukyo Bridge. 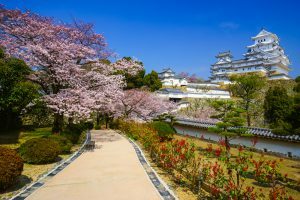 Fukuoka Castle – With a thousand sakura trees growing in Maizuru Park in the Fukuoka Castle ruins area, the Fukuoka Castle offers a splendid view of the event, as well as plenty of space for picnics and get-togethers. 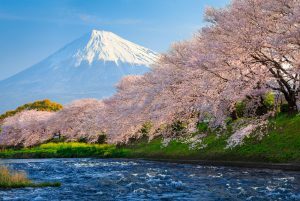 Nishi Park – Regarded as one of the top 100 cherry blossom viewing spots in Japan, Nishi Park sits on a hillside, with more than one thousand beautiful, full-grown cherry trees.